The single “Down in the Tube Station at Midnight” was one of the band’s most successful chart hits up to that point, peaking at #15 on the UK charts. In 2000, Q magazine placed All Mod Cons at number 50 in its list of the 100 Greatest British Albums Ever. I think it is The Jams most fully realised album, it is their best album. I’ve highlighted my favourite tracks, but all the tracks are really strong, great playing and great singing all around. The Production is unusually complex and sophisticated for a punk/new wave album. The song “Down in the Tube Station at Midnight” is a first-person narrative of a young man who walks into a tube station on the way home to his wife, and is beaten by far right thugs. 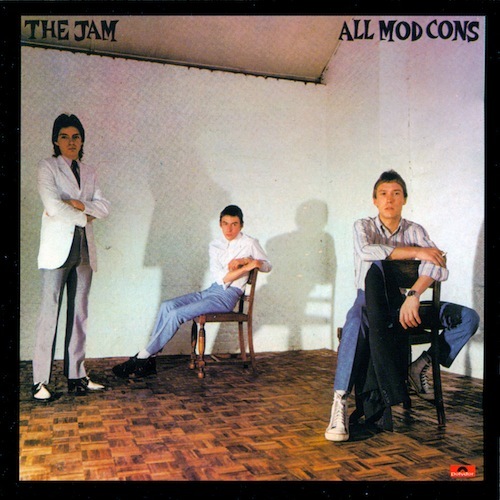 The lyrics of the song “All Mod Cons” criticise fickle people who attach themselves to people who enjoy success and leave them once that is over. The Jam regrouped and refocused for All Mod Cons, an album that marked a great leap in songwriting maturity and sense of purpose. For the first time, Paul Weller built, rather than fell back, upon his influences, carving a distinct voice all his own; he employed a story-style narrative with invented characters and vivid British imagery à la Ray Davies to make incisive social commentary — all in a musically irresistible package. The youthful perspective and impassioned delivery on All Mod Cons first earned Weller the “voice of a generation” tag, and it certainly captures a moment in time, but really, the feelings and sentiments expressed on the album just as easily speak to any future generation of young people. Terms like “classic” are often bandied about, but in the case of All Mod Cons, it is certainly deserved. All Mod Cons / Setting Sons / Sound Affects is my favourite British trilogy of all time. Genius – and they left so many fantastic singles and b sides off those albums too. Classic English songwriting. Still listen to this album all these years later. Paul Weller is a great artist and his work stands the test of time!